Cranes are a common sight on construction sites and at other industrial operations throughout the Dallas and Fort Worth area. They are used to lift heavy materials and transport them to other locations, saving workers hours of backbreaking manual labor. However, they can be extremely dangerous if not used properly, or they malfunction. Employees who are involved in crane accidents can suffer catastrophic injuries that prevent them from working. Sometimes, these injuries prove to be fatal. Workers injured in crane accidents are entitled to compensation for their injuries, but it can be difficult to hold a non-subscriber employer responsible for compensating them. Non-subscriber employers are those who have opted out of providing worker’s compensation benefits under Texas law. However, they are 100 percent responsible for compensating injured victims if they were at least one percent negligent in causing the accident. Cranes have weight limits on the loads they can transport to prevent a crane from tipping over. Also, rigging and counterweights are used to balance the weight. When these weight limits are not followed, the crane can tip over or the boom could collapse, endangering the crane operator and nearby workers. If the crane is not assembled properly or it does not have the proper wood or metal block supports, loads can shift and cause the crane to collapse. Cranes are complicated industrial machines that take training to operate. 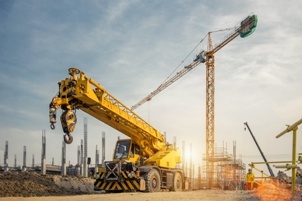 When employers do not properly train individuals or require them to complete Occupational Safety and Health Administration (OSHA) courses on operating a crane, an accident is likely to occur due to the operator’s incompetence. When loads are not rigged according to safety guidelines or rigs are used with missing or broken parts, the rigging can fail, and the load can be dropped on individuals working underneath or near the crane. If a crane is not properly inspected and maintained by an employer, mechanical failure can cause the crane to malfunction, resulting in a preventable accident. A common cause of crane accidents is contact with electrical lines when operators do not remain conscious of nearby overhead live wires, or the electrical current is not shut off. This can lead to tragic electrocutions and deaths. Were you injured in a crane accident in the Dallas/Fort Worth area? Was a loved one killed? At the Hart Law Firm, our experienced workplace accident attorneys are committed to fighting for the rights of employees who work for non-subscriber employers. To learn how we can assist you, contact us online or call our office directly at 817.380.4888 to schedule your free consultation.